Lisburn based Momentum Motorsport built this stunning competition ready Scirocco to be used in the Scottish Saloon Car Championship. To say I was impressed with this Scirocco would be an understatement. From the first time I saw it I couldn’t help but be drawn in by the attention to detail, the quality of components and high standard of custom fabrication that brought it all together. Everything on the car was just amazing from the engine bay to the rear suspension set up to the pedal box and roll cage it was just so much to take in, in one go. The car runs a Mitsubishi Lancer Evolution 4G64 MIVEC block with a multitude of internal work. An 88mm Billet crank has been fitted along with 162mm Manley rods, JE 87mm High Compression Pistons and over sized valves. Solid lifters, double valve springs and titanium retainers have also been installed into this impressive unit. The original water pump has been replaced by a Davies Craig EWP 115 pump and an APT Pace dry sump system has been fitted. The AMS Tubular Exhaust Manifold and Intake is an absolute work of art, and the first thing that caught my eye looking into the engine bay, with a bespoke titanium side exit exhaust system. As you would imagine for a race car the turbo has been changed and an up rated turbo from Forced Performance. Dual AMS Fuel Rails with 4x 750cc RC Injectors and 4x 560cc RC Injectors have also been installed. The car retains some Volkswagen traits in the shape of a Volkswagen R32 drive-by-wire throttle body. With such a car comes the first item of safety, an ATL Fuel Cell – when you’re going as quickly as this baby shifts you need all the proper equipment and this build has that throughout. Momentum Motorsport decided on a DJM 6 speed sequential dog box which is controlled via a Geartronics pneumatic paddle shift system which looks like a complete hoot to use. 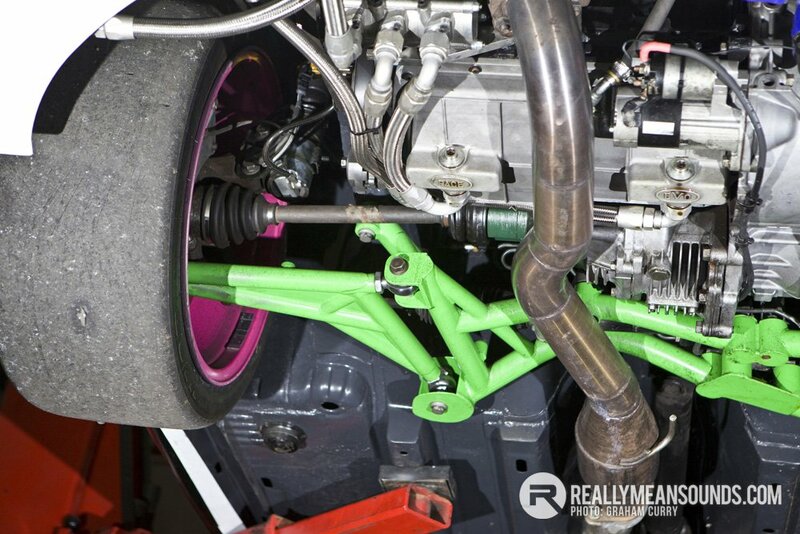 The car runs a Lancer Evolution RS rear differential and Evolution RS drive shafts in the rear. Okay, so we have stacks of power coming from our Lancer Evolution engine and we have it transferred to the ground through some fat Michelin slicks, but none of that is any use unless the car has the suspension system to match. Momentum Motorsport have designed their own suspension around a Nitron bespoke 4-Way adjustable coil over system. The car is fitted with Momentum Motorsport tubular front sub frame and rear sub frame. The front wishbones are designed by Momentum Motorsport as are the adjustable rear camber arms and toe arms. It really is impressive stuff it has to be said. Stopping power is forever important and it is no different here. AP Racing DTM 8-pot callipers on the front and AP Racing DTM 4-pot callipers on the rear that clasp AP Racing ventilated discs. Brake lines have been up rated to braided Goodridge items and a beautiful Tilton triple cylinder bias pedal box sits at your feet as you can see above. Engine management comes from a Motec M800 ECU and a Motec PDM 15 which basically replaces conventional relays, fuses and circuit breakers and therefore simplifies wiring and takes out a lot of unnecessary weight. The digital dash readout where the driver can check all the necessary information with regards to temperatures, rev counter and gear selection is provided through an AIM MXL Pro dash and looks fantastic. All the electronics work through a Mil-Spec Wiring loom with a single plug detachable engine loom. One of my favourite parts of the car is the Cosworth membrane switch panel with all the different settings right at the driver’s finger tips. You often hear people in motorsport circles refer to the interior of the car as their “office”. Well, as offices go the Scirocco is a peach! The most dominating point of the interior has to be that T45 spec roll cage. Beautifully welded, but most importantly, extremely safe too. Holding the driver in place is a Cobra Sebring Pro carbon bucket seat with TRS 6 point 3″ harness and when you’re strapped in with one of these 6 point harnesses you better believe you are not going anywhere. Take a look through our image gallery on this technical build so you can appreciate the detail for yourself. Thanks to Andrew Mercer and Momentum Motorsport. Great work Graham! That looks to be a great car, any idea of bhp? I assume it's limited to a certain figure for FIA/class rules? | Great work Graham! That looks to be a great car, any idea of bhp? I assume it's limited to a certain figure for FIA/class rules? Dont quote me on this but i think its sitting @600bhp. Love the work and engineering that's gone into this. I need to have a drive In something as focussed as this someday. You mention an ATL fuel cell, however I am seeing a custom pro alloy unit? | Love the work and engineering that's gone into this. I need to have a drive In something as focussed as this someday. You mention an ATL fuel cell, however I am seeing a custom pro alloy unit?